Make and Company designed murals for Dispensary 33's clean, open space. There were two things everyone asked me when I was first diagnosed with cancer: "Will you lose your hair?" and "Can you get medicinal marijuana?" The short answer to both of those questions was "yes." But when it comes to the issue of medical cannabis in Illinois, nothing is as simple as a one-word answer. The application alone requires three forms of ID, a current photo, fingerprints, a background check, a five-page physician approval form, and a $150 fee ($100 for the application, $50 for the fingerprints). While I recently finished treatment for Hodgkin's lymphoma, the symptoms of the disease and the chemotherapy continue for at least six months posttreatment. Here's hoping my application gets approved, because lucky for me, Chicago's first medical marijuana dispensary, Dispensary 33, is four blocks away from my house. The Andersonville location (5001 N. Clark) held an open house over the weekend, the only time members of the public were able to explore the space. When it's fully operational, only patients with a medical marijuana card will be allowed in the dispensary. They will be required to sign in at the front desk and will then be buzzed into the main room, where product and accessories will be available. There won't be any marijuana available for about two more weeks, and edibles won't be available until January, but in the meantime the staff is available to help with the Medical Cannabis Pilot Program application. And the staff knows a thing or two about the application process; Dispensary 33 plans to hire staff members who are also patients, so they can legally try the product and properly inform customers. I learned this while visiting the open house, at the point when I suffered an extreme hot flash—psuedomenopausal symptoms are just one of the many lovely side effects that stick with female cancer patients long after treatment. Sue Cook, one of the store's employees or "budtenders," graciously took me to the back room to get water and cool down a little bit. She's no stranger to the onset of sudden and uncomfortable physical effects—Cook has fibromyalgia. "This is the first time having fibro has been a positive," Cook says. "You know how it is—it's hard getting a job when you have a disability." She, like many others, tried the only legal option before now, a pill called Marinol that contains man-made THC, but disliked the effects. While I never tried Marinol myself, I've heard from my doctors and other patients that it either does little to help or makes you feel stoned out of your mind. Cook's experience was the latter. She's adamant about the fact that Dispensary 33 and other medical marijuana providers aren't about getting people high, they're about providing comfort to patients with debilitating illnesses. Maybe it's my conservative midwestern upbringing, but walking into the open house, I had a lot of expectations that were immediately disproven. I thought the place might be hard to find and dingy, like some sort of drug den; it's actually a modern, open space, in plain sight with clean lines, murals by Make and Company, and honeycomb-shaped display cases that give off the feeling of an Apple store. I expected a slew of recreational pot users to line up and see what they could get away with; the crowd was mostly patients asking the same questions I had about when they could start buying and what was going to treat their symptoms the best. One of the worst things I experienced when I was going through chemotherapy was a loss of appetite, nausea, and vomiting. During my first two months of treatment I lost nearly 40 pounds because I just couldn't eat, and anything that I managed to choke down probably wasn't going to be in my stomach for long. "For that particular case, there has been a ton of clinical research on the effects of cannabis especially in wasting syndrome and appetite stimulation, and this is one of the things very few physicians contest," says Richard Park, the dispensary's director of education and outreach. "In the treatment of chemotherapy and to stimulate appetite, we know that what you need is a strain that contains a high ratio of THC. We also know that the best consumption method is inhalation." Park, while not a patient, is a self-proclaimed nerd who spends his time vetting scientific research and educating the staff, patients, and physicians with evidence from clinical studies. He reiterates that it's not about getting people high, and weed isn’t just some magical fix; there is real science supporting everything they do. So where does the weed come from? As with everything else surrounding the process, that is extremely regulated. There are 18 licensed cultivators slated to open in Illinois, one of which will be in Cook County. But because of strict legislation it's unlikely that one will exist within city limits anytime soon, according to Park. He supports the strict guidelines because he doesn't want the medical marijuana culture in Illinois to mimic what's happened in California, where anyone with $40 and self-diagnosed anxiety is granted access. "I think the future isn't 'Are regulations going to become more lax?'" Park says. "I think the future is expanding the program to where people who need help are actually getting it." The immediate future of Dispensary 33 is education, education, education. When new strains of marijuana come in, employees and patients will be encouraged to take notes on the effects and particulars of each variety and share their experiences with one another. Cook even started sharing tips with me about how to best cook up your weed, and what amount is perfect for soothing her aches and pains (an eighth should be about 50 doses). It's clear that there's already a community building around the dispensary. As I stood in the back room, splashing water on my face, I felt welcome to be part of it. Cook handed me a paper towel, walked me back out to the main room and said, "You're going to feel a lot better in two weeks." I think she's right. The administration signaled a willingness this week to crack down on legal weed. 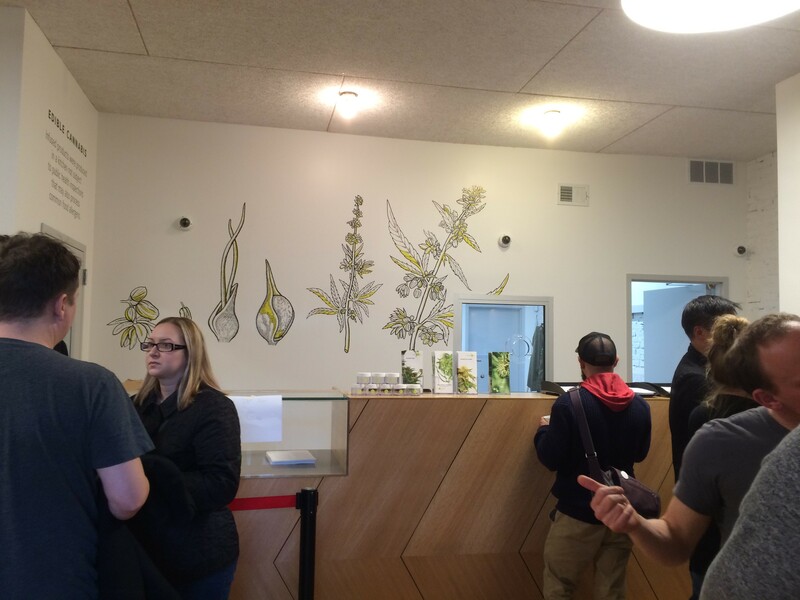 Chicago's second dispensary faced tough regulations to get people in the door. Chicago's first medicinal cannabis dispensary makes it on to the list of certified dispensaries in Illinois. A new stance on pot can lead the nation's retreat from its misguided drug war. At a press conference Monday, a group of elected officials set a goal of legalizing, regulating, and taxing marijuana sales for recreational use in Illinois.